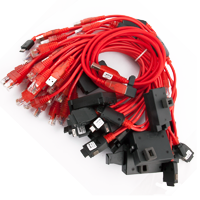 Additional 34 pcs BB5 cables for JAF are set of 34 cables that fits for JAF that update your list to leatest models. If you buy this set you will pay less instead of buying all seperate cables. 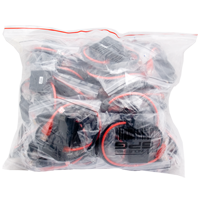 Additional cable set for MultiBox (30 pcs) it's additional cable set for existing 49 pcs cable set that comes with MultiBox that allows upgrade their list of cables to newest one 79 cable set. In complete you will find cables for Alc E801, Sam D800/809, 290 , Sam E700, Sam X540, 9@9h, LG 18 pin, Mot V6, P880 , 8800+, C600, K288, K808/P800, X801+, N1000, S560, 5 pin, E760, E530, TCL, P8500, A7, KG200/300, K800, E860, S100, E810, D720, C268. Additional pack cable for UltraLOGIC it's a 30 pcs of additional wires for UltraLOGIC that can support all phone models if you got already UltraLOGIC Box. Right now you don't have to buy each cable by each but you may buy full pack. Cable set COMBO Rj45/RJ48 for UFST/Cyclone/ATF 2in1 136 pcs are set of COMBO cables 2in1 for UFS/UFST/Cyclone/JAF® and ATF/Genie/MTBOX dedicated for these devices - set contaisn only Nokia cables includign leatest one without any additional cable for UFS like LG, Samsung etc. Cable set COMBO Rj45/RJ48 for UFST/Cyclone/ATF 2in1 70 pcs are set of COMBO cables 2in1 for UFS/UFST/Cyclone/JAF® and ATF/Genie/MTBOX dedicated for these devices - set contaisn only Nokia cables includign leatest one without any additional cable for UFS like LG, Samsung etc. 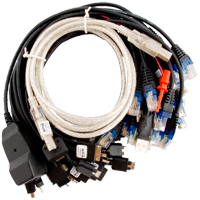 Cable set for All Martech Activations are full set of 23 cables needed for all future and actuall Martech Tool software. In set you will also fidn converter from Infinity, Furiosu standard to Martech stadnard cables. Cable set Philips for JAF® Box it's additional set of 9 cables to work with free addon for supporting Philips phones uunder JAF® Box. By buying this set you can start working with supported by JAF® Box phones right away.